Evolution is the process by which organisms have descended from ancient ancestors. In Darwin’s theory, all organisms including human share common ancestors, and species change over time and space. The 2018 Nobel Prize in Chemistry was awarded to “test-tube” evolution, also known as directed evolution, which was contributed by Frances Arnold, Gregory Winter and George Smith. Arnold carried out pioneering work in the 1990s on directed evolution of enzymes. In her seminal work, she obtained a mutant of subtilisin E that was over 200 times more active than wildtype in a highly unnatural environment by screening a library displayed in B. subtilis system. Smith pioneered a method known as phage display in 1985, which is now a commonly used in vivo protein display method in protein engineering. Winter developed and improved the method of phage display, and invented ways to use it to evolve antibodies adapted for use as human therapeutics. These methods are further optimized and now known as major approaches of directed evolution, widely used in pharmaceutical development and basic research. The primary mechanism of evolutionary change is natural selection. In nature, variation exists within all populations of organisms and occurs partly because random mutations take place in the genome of an individual organism. These mutations can be passed on from parent to offspring, and therefore, such changes are heritable. The struggle for resources will favor individuals with some variations over others from one generation to the next, and thereby change the frequency of traits within the population. Evolution can also occur on the single molecule level, such as proteins that have evolved in the context of the organism in order to survive. During application, natural proteins may not meet industrial needs, because they have evolved in single cells for millions of years and adopted specific properties in the physiological environment. Therefore, protein engineering is necessary to make these proteins lively in artificial environments. The two extremes of protein engineering are rational design and directed evolution. While rational design requires in-depth knowledge of the protein structure and its catalytic mechanism, directed evolution only needs a goal. It is a protein engineering method that mimics natural evolution. A typical process of directed evolution includes four general steps: i) diversification: generate gene library of the target protein, ii) expression of protein library, iii) screen the library under a specific condition for desired functions and iv) amplify the selected “winner” (a member in the library). Figure 1. 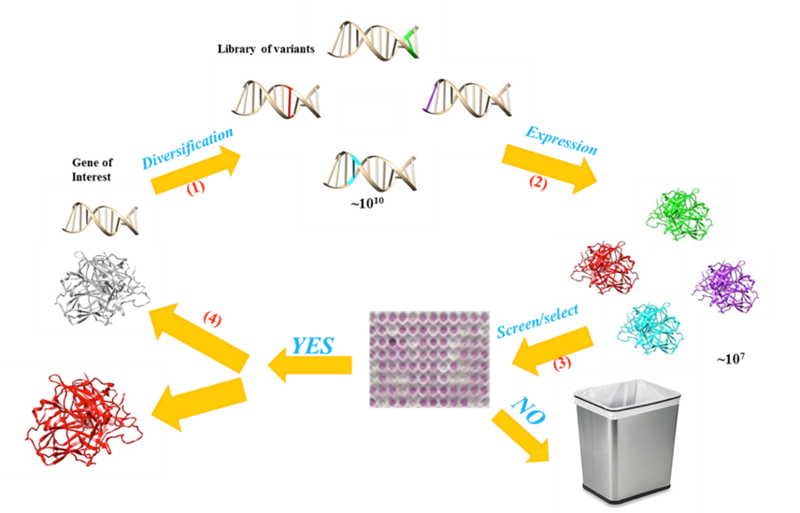 An illustration of directed evolution, a protein engineering method that mimics natural evolutions. Protein display is a key technology to express the gene library during directed evolution. The principle of protein display technologies is to present various similar proteins in a certain system, and each protein is physically linked to its coding DNA or RNA. In another word, protein display connects phenotypes to their corresponding genotype. Initially phage display was developed to express the target protein on the outer coat of a bacteriophage. Today, various display methods have been developed and could be divided into two major categories, in vivo and in vitro. Typical in vivo display technologies include Phage Display, E.coli Display, Yeast Display, as well as some other Special Cell-Based Display. 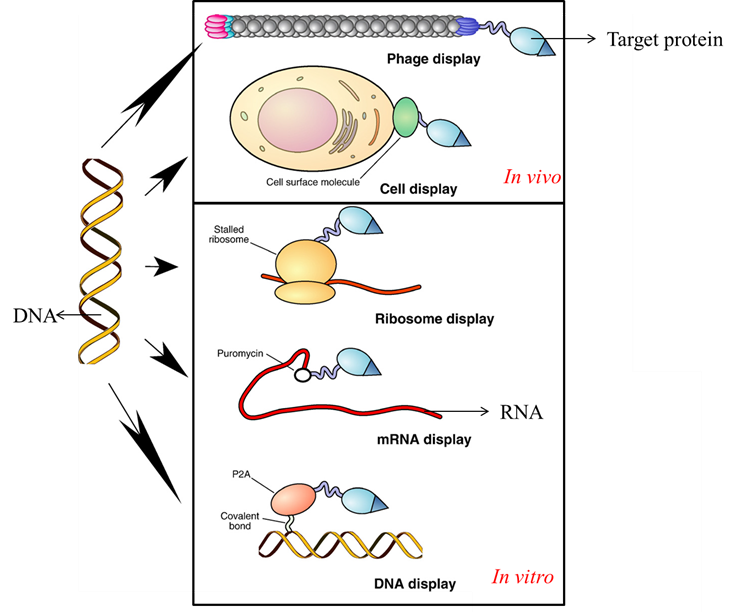 In vitro display, also known as Cell-Free Display consists of ribosome, RNA and DNA display. Figure 2. Scheme of available display technologies. The field of protein engineering is expanding fast in the past two decades in both industrial and health care sectors. With years of experience and advanced instruments, Creative BioMart has been in the front line of directed evolution. We provide the complete package from gene library construction, through selecting the best display strategy and high-throughput screening, and eventually to production and gene/protein identification. Creative BioMart is specialized in both in vivo and in vitro display platforms that were developed to accommodate various targets, including proteins, antibodies, small molecules, strains etc.